It currently very fashionable to be transgender. When I was born the only two boxes on the birth certificate were “boy” or “girl”. Facebook now gives you 71 gender options you can choose from. That’s not a typo, 71! Gender is being viewed as a continuum rather than a binary state. It’s all about who you feel like inside. 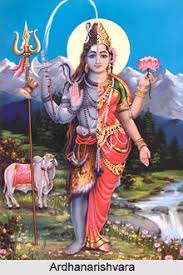 The ancient Indians as usual had given this much thought centuries ago and worshiped a godlike figure representing both the masculine and feminine energies of the world uniting in one figure. In temples you will find the deity below called Ardhanarishvara represented in statues and paintings. “Ardha” means half. The ancient Hindus meant to convey that both the male and the female are required for a balance of universal energies. To the ancients the symbolism meant optimal balance of the male and female energies in this world were required for equilibrium. I like to think of investing as having a male version and a female version: Active investing and passive investing. I think of active investing as a male energy. Active investors are out hunting for alpha and beating the market. Investment managers use their brainpower (“skill”) to try to actively select investments to generate higher returns than the general market. Active investing has a passive (female) side to it. To keep their clients happy active investors often feel the need to “hug” or follow the general returns of the market as many of them are benchmarked against this. Passive investing is a female energy. Passive investors buy and hold pre-populated indexes of market tracking investments. It’s supposed to be the “easy” option in investing. But if you decide to be a passive (female) investor you come across a massive problem. You must choose the indexes you want to track. Will the US do better than China? Will the Tech sector index do better than Industrials? You need skill and research to decide. Logging onto the Blackrock (one of the two largest passive products provider) website as an individual UK investor gives me 2,214 index and ETF options to choose from. That’s WAY more than the number of shoes on display at Selfridge’s! How on earth is a girl to choose. Financial journalism loves to set up boxing matches between the male, active investing and the female, passive investing. You’re only supposed to be able to pick one, defining yourself as an active investor or a passive investor. If you’re investing for yourself why not pick both? Join the trend and invest along the active/passive continuum. It’s OK to come out as a transgender investor.